A very annoying end-of-the-day time waster is having to wait for all of the day’s payments to arrive before you can enter the deposit. With our accounting software, you don’t have to wait. Instead, you can enter each payment on a separate line. As payments come in throughout the day, you can enter them and just add more as they arrive. No more having to stay late on busy payment days! You’ll have the flexibility to enter the payments whenever you have a few minutes during the day, instead of having to rush to put them all in right at the close of business. 1. Create a new deposit to begin posting the incoming rent checks. After each entry click on another row to save the current row, then after all transactions are entered, click to 'Save' your deposit (but wait to hit 'Post' until the end of the day when the deposit is ready to go to the bank). 2. Click the Edit button to add additional items to the deposit at any time. 3. Once you have finished for the day, click 'Post', and the deposit is automatically transferred to the appropriate ledgers for both the tenant and the owner. No more transactions can be added at this point. 4. You can include a detailed transaction remark for each transaction. 5. Once a deposit is posted, you can search by the deposit number to find the deposit. 6. 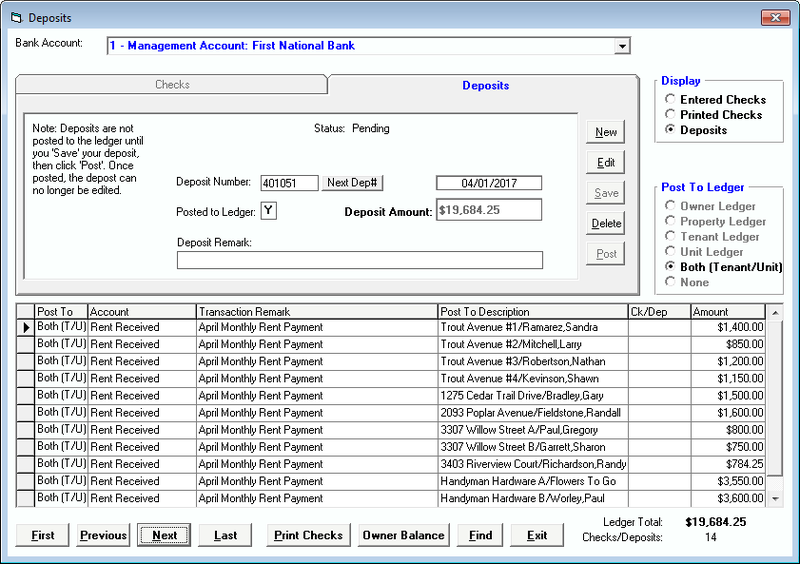 You can print deposit receipts or tickets, at any time, from the property management program report menu. The Tenant File has developed property management software that includes all of the most important features that property management companies need. Contact us today to learn all about how our software can simplify the running of your business.